Given that Seth Godin’s Tribes: We Need You to Lead Us came out at the end of last year, the book has been reviewed extensively, and if you haven’t read it yet, I can only recommend that you do. I recently translated it into French and wrote a foreword for it — of which I made the English adaptation (three posts). Published in French by Diateino (http://www.diateino.com). Available for pre-order. Hardcover – Sept 1, 2009; eBook available at http://izibook.eyrolles.com (July 22, 2008). 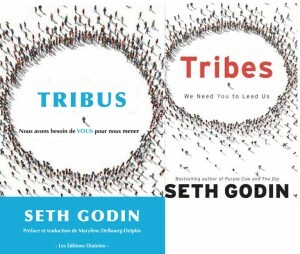 Seth Godin’s Tribes has been an Amazon.com best-seller in the Leadership et Business & Investing categories since it came out (October 2008). This is not surprising. The book is short, easy to read and, like all of Seth Godin’s books, both entertaining and educational. A book that wakes you up… The book sounds like a motivational speech meant to shake up anyone who “would like” to start something – anything, a restaurant, a musical group, a company, a new product line, whatever – but who doesn’t feel up to the task, either afraid to jump in or terrorized at the idea of failing. Seth Godin passionately urges you to rid yourself of your fears and get going. To stimulate rather than reassure you (you are not allowed to do nothing), Godin slays a number of preconceived ideas regarding what constitutes an ideal leader. You don’t have to be a stud, a social butterfly, or a fashion plate. You can speak softly, even be somewhat reserved, like Meghan McDonald, a Team Rock coach in New Rochelle, NY; you can have a big ego like Steve Jobs if your creativity offsets its negative side effects; you can be low in a company’s totem pole, like Jim Deligatti, the third-tier McDonald franchisee who invented the Big Mac. Anybody can become a leader. Leaders have no common traits, except for these: a constructive rejection of the status quo, the drive that enables them to change things, and optimism that provides a platform for people eager to go their way – to follow them. Because you won’t be a leader alone: you need a tribe, i.e. “a group of people connected to one another, connected to a leader, and connected to an idea.” So, create your tribe – or find a tribe that needs you. Opportunities are endless. Godin gives a multitude of examples as he writes, often randomly, in unstructured sections that flow in and out of each other. His message, however, remains unwavering: to stimulate his reader’s desire to get out of the business-as-usual mentality — when you pretend for days on end that everything is fine and dandy, yet are bored to tears. You can read this book in several ways. At its simplest level, it sounds like an eloquent marketer’s declaration of faith sparklingly presenting the facets of two trendy words, “tribe” and “leadership.” Yet do not discount the value of the book by thinking “that’s sheer marketing” … or revise your opinions about marketing. If you have mixed feelings about public speakers paid to deliver motivational lectures, a pep talk of sorts, remember that the world that surrounds us is full of depressed masses who don’t know where to start to break free from the doldrums. So why not boost them a bit? ” Yes, you can,” was Obama’s slogan, sure, but also the 1972 rallying slogan popularized by César Chávez et Dolores Huerta, who co-founded the United Farm Workers, a California farm workers union: “Sí, se puede”. After all, fervor is contagious before being pestilential! But there is more. Tribes are more than a trendy phenomenon… More than a trendy phenomenon that can be grabbed to provide a book with a catchy title, tribes are a societal reality, most patently epitomized today by the popularity of social networks everywhere in the world, and of course, in France. Last February, a study performed by comScore, Inc. “showed that 22 million French Internet users visited at least one social networking site in December 2008, reaching 64 percent of the total French Internet audience.” This is up 45 percent from the previous year – even though the social media reach is still lower in France than in the UK (79.8 %) or Spain (74.6 %). Of all the social networks, Facebook is now the most visited, followed by Skyrock, and then Copains d’Avant, MySpace, FlickR, Trombi, hi5, Netlog, MySpace, Viadeo, and Badoo… to name a few. Skyrock is a somewhat special case. Although apparently toppled from the top spot by Facebook as a social network, Skyrock is still ahead of Overblog and Blogger as a blog platform, not only in terms of unique visitors, but also because of the time spent by those visitors (54 minutes in average versus 10 minutes and 7 minutes for Overblog and Blogger respectively). Worth mentioning also is Skyrock’s unique position in the history of social networks in France. Created in 1986 by Pierre Bellanger (one of the most notorious contributors to the “free radio” movement who started Radio Paris 80, an early symbol of the media tribalism), Skyrock embraced the various forms on Urban Music in the 1990’s, then followed its audience to the Internet, created a blog platform in 2002, and positioned itself as a social network in 2007. In fact, Skyrock exemplary evolution illustrates both the diversity and the continuity of the notion of tribes since the 1980’s — that is, when the use of the word “tribe” spread massively outside the sphere of anthropologists. What people are looking for is not participating in a democracy where they are asked to vote once in a while, but be part of an environment where they can have an active role as leaders or as followers, dynamically sharing goals and emotions with others. 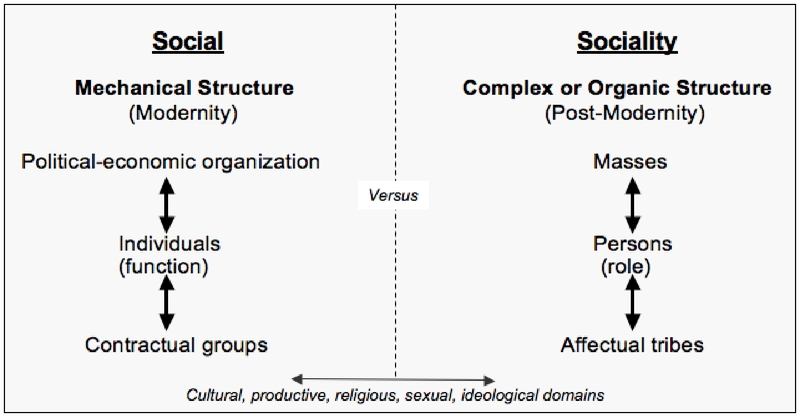 As an alternative to an overly rationalized society, people are tempted to choose the empathic atmosphere of tribes. However enthused he may be about the rejuvenating power of tribes, Godin still acknowledges the repressiveness of older tribes — tribes that have grown too big, become too bureaucratic, whose mission diluted over time. That’s what makes the difference, according to him, between the American Automobile Association (AAA), with its millions of members, and the much smaller National Rifle Association (NRA). 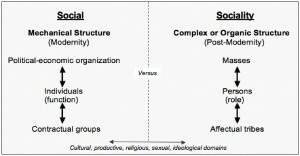 The challenge for a tribe is to keep its focus, keep an active leadership capable of dynamically updating its purpose in a world that moves quickly –this differentiates the postmodern tribes that Godin describes from interest groups, feudalisms, cliques, and casts that mainly cater to maintaining their image or their statutory advantages. Yet, the latter are also tribes, like it or not. As true as it is that any tribe tries to foster a sense of brother/sisterhood, fraternity between tribes is a whole different story. Le Temps des tribus – le déclin de l’individualisme dans les sociétés de masse) was published in France en 1988 and again in 2000. The book was translated in 1996 (Sage Publications). “The challenge for a tribe is to keep its focus, keep an active leadership capable of dynamically updating its purpose in a world that moves quickly”. I think a lot of business leaders and political leaders forget that the world is constantly changing around them, and that purpose is something that isn’t written in stone. Thanks for such a thoughtful post! If you play golf with your boss, does he/she have to win? Is Attitude always “more important” than IQ? “De-season” yourself to remain innovative! Women, Invent Your Future: Attend Ruth Stergiou’s conference in Sunnyvale (CA) this week!